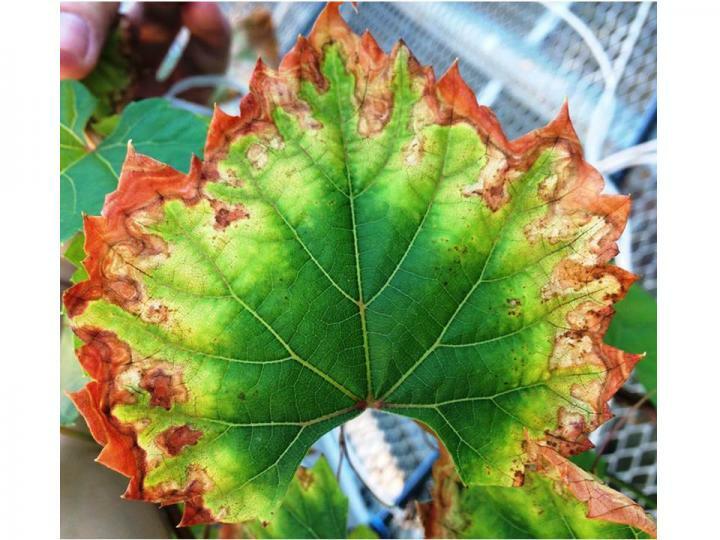 IMAGE: An enzyme appears to enable Xyllela fastidiosa bacteria to infect grapevines with Pierce's disease, causing serious leaf damage as pictured here. UC Davis plant scientists have identified an enzyme that appears to play a key role in the insect-transmitted bacterial infection of grapevines with Pierce's disease, which annually costs California's grape and wine industries more than $100 million. The researchers hope that the discovery, which runs counter to existing theories, will lead to new diagnostics and potential treatments for Pierce's disease. Their findings will be reported Tuesday, Jan. 12, in Scientific Reports, an online journal of the Nature Publishing Group, at http://www.nature.com/articles/srep18598. "With a bacterial disease — much like cancer — if you understand how the virulent form spreads, you can better control or remove it, " said Abhaya Dandekar, a professor of plant sciences and senior author on the study. "We anticipate that this discovery could open new ways to think about dealing with Pierce's disease and highlight other areas of immune response, in general, that haven't yet been considered," he said. Pierce's disease, first identified in the 1890s, is caused by the bacterium Xylella fastidiosa and is characterized by yellowed and browning leaves that eventually drop from the vine. The disease is transmitted from vine to vine by small, winged insects called sharpshooters. Pierce's disease is established in Northern California, where it is transmitted by the blue-green sharpshooter, which lives near rivers and streams. The disease became a serious threat to California agriculture in 1996 when the glassywinged sharpshooter — another Pierce's disease carrier native to the Southwest — was discovered in the Temecula Valley of Southern California. It's been known for a number of years that when Xyllela fastidiosa invades a grapevine, it produces a biofilm or gel in the xylem — the vascular tissue that transports water and some nutrients throughout the vine. So Dandekar and colleagues set out to investigate an alternative mechanism by which Xyllela fastidiosa might be wreaking havoc with the vine's physiology. The research team began by analyzing the bacteria's secretome — the entire collection of enzymes and other proteins secreted by a disease-causing agent like Xyllela fastidiosa during the infection process. Such secreted proteins are known to play key roles in triggering many plant diseases. The researchers went on to confirm their suspicions by demonstrating that a mutant strain of Xyllela fastidiosa bacteria — with a specific gene knocked out, or inactivated — lacked the ability to cause infection in grapevines. "The LesA enzyme has the ability to move through cell membranes, equipping the Xyllela fastidiosa bacteria to invade the grapevine and to live in its xylem tissues, where it feeds on fatlike compounds called lipids," Dandekar says. In this way, the LesA enzyme triggers the process that causes the typical Pierce's disease leaf damage — a process completely unrelated to the xylem blockage and water stress that had previously been thought to cause the symptomatic leaf damage. The research for the newly published study was conducted by Rafael Nascimiento and Hossein Gouran, both graduate students in Dandekar's laboratory. Dandekar said that his research team plans to move forward with Pierce's disease research in hopes of developing ways to counteract the disease. Funding for the newly published study was provided by the Pierce's Disease Board of the California Department of Food and Agriculture.